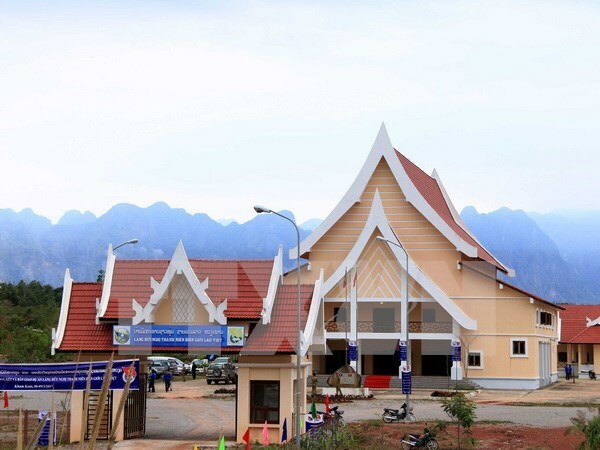 Vientiane (VNA) – The Ho Chi Minh Communist Youth Union (HCYU) and the Lao People’s Revolutionary Youth Union (LPRYU) on March 9 handed over the Vietnam-Laos border friendship youth village project to Khamkeut district in the Lao central province of Bolikhamsai. Addressing the hand-over ceremony, First Secretary of the HCYU Central Committee Le Quoc Phong said the village is a symbol of the bilateral cooperation between the two youth organisations. It will provide a place for young people to settle down and serve as a key force in social-economic development and national defence and security in the border area. The project also aims to provide a model for new residential areas with sustainable development and transfer modern technologies in agro-forestry production for young people, he added. He hoped the Lao side will manage the village effectively and continue to build new production models to spur local socio-economic growth while strengthening the solidarity, friendship, and comprehensive collaboration between the two nations’ youngsters. Secretary of the LPRYU Central Committee Sonethanou Thammavong expressed his deep gratitude to the Vietnamese Party, State and people, particularly the HCYU, for supporting Laos in any circumstances. The project is expected to help Lao farmers change their mindset in cultivation and animal husbandry, thus improving their living standards, he said. The village is not only a symbol of the two countries’ cooperation but also promotes the traditional solidarity between the two peoples, especially among youngsters. Right after the signing and hand-over ceremony, the two youth unions prevented gift packages to a dozen of households living in the village, which covers 1,034 hectares in Khamkeut district.